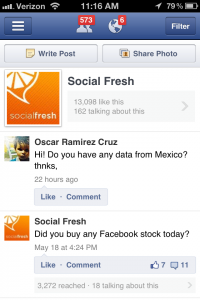 Facebook launched a new app on Monday that lets you manage your Facebook pages from your iPhone. And while lots of Facebook page admins had difficulty downloading and launching the app yesterday, because of high demand, it seems to be working smoothly today and we had a chance to do a full walkthrough. 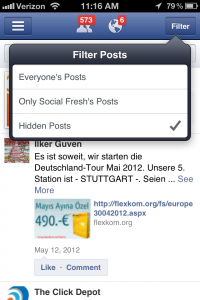 Simply put, managing Facebook pages from your iPhone just got a lot easier. So if you are on the go, or always have your iPhone on you as a Facebook page admin, this is a must download. 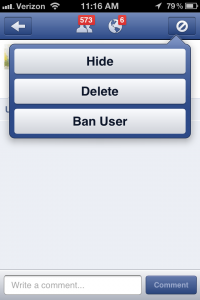 You will also receive notifications when someone likes your page, comments on posts and other activity. The app will be very useful for users who manage multiple pages or those who may not want the full, personal Facebook app installed on a work phone or other work device. The app is free to download. After downloading, login to your Facebook account to begin managing your pages. Here is the direct link to download the app. The new app requires iOS 4.2 or later. And yet the app will make on the go page management and content updating much easier. This app comes after Facebook’s announcement they are also launching their own app store center that will enable paid Facebook apps for iOS and Android devices. “The App Center is designed to grow mobile apps that use Facebook – whether they’re on iOS, Android or the mobile web,” said Facebook engineer, Aaron Brady. 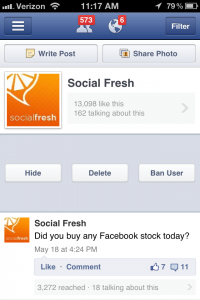 A few years ago, Facebook was very comfortable avoiding apps and focusing on HTML5 solutions for its users. With the pre IPO discussions about how important mobile is, the acquisition of Instagram, the App store and this latest addition to the Facebook App family — it is clear that Facebook is for real about becoming a mobile first platform.